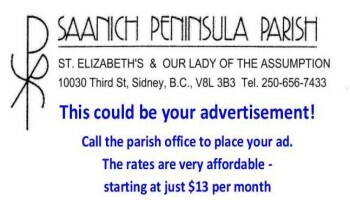 Saanich Peninsula Parish encompasses two churches, Our Lady of the Assumption, and St. Elizabeth of Hungary. 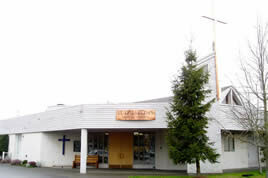 Our Lady of the Assumption came into being as a mission service to the Saanich Native Indians by the Oblates of Mary Immaculate who along with the Brothers of Mary Immaculate continue to have a special devotion to and relationship with the native Indians. The Saanich Peninsula, known for its peaceful farmland and rich tribal lore, was also the scene of many conflicts among various tribes. The Cowichans, Snohomish, Fort Rupert, Songhees, Salish, Haida, Pauquechin, Tsardip, Tseigurn, Northern Tribes, and others all sought to control what they considered a utopia of climate, beauty and natural resources. In May 1850, Rev Father Lempfrit, OMI, was the first 'Black Robe" known to visit the Saanich Indians. His visit lasted only one week during which he baptized upwards of 300 people. In 1859, Father Chirouse, O.M.I., visited the East Saanich Reservation. In 1860, Father Jayol, O.M.I., with the assistance of Brother Blonchel and some Indians built a log church dwelling. He remained there for three years and was followed by Father D'Herbomes. Father D'Herbomes was later appointed Bishop and Superior of the Oblates and built a church on the Tsartlip Reserve. In 1865, Father Mandart, a Breton, was ordained for the Victoria Diocese. He is credited as being the real founder of the Saanich Mission. On his arrival he fashioned a church and home from a large fallen tree with upturned roots. With help from the Indians, he then built a small church, which was later blessed and dedicated to the Assumption of the Blessed Virgin by Bishop Seghers in 1876. Upon Father Mandart's recall to Victoria in 1886, priests from the Cathedral served the Saanich Mission. In 1893, one year after his ordination in Europe, Father Adrian Joseph Vullinghs performed his first baptism in Saanich. Apparently he had found Father Mandart's original 20 x 26 foot church, built of logs with squared timbers for pews; an altar of paper and living quarters consisting of two small cold rooms at the back of the church. 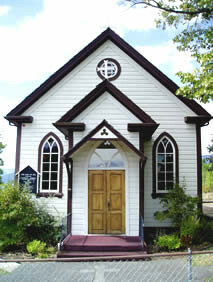 He served the area from 1893 to 1909 and built the present church and residence on West Saanich Road. He took great pride in and was renown for his vegetable and flower gardens, shrubs and trees. He was recalled to Holland, and returned to Victoria in 1910. From then on Fathers Scheelen, Ronden, Contenraad, Boshouwers and Lemmens of the Marists Fathers of the Company of Mary served the Saanich Mission. There are very few reports or communications concerning Sidney, which was organized in 1893. This is may attributed to the fact that, while the Saanich Inlet provided good anchorage, the region lacked roads. It is known, however, that Father Vullinghs and priests from the Cathedral served Sidney. In 1908 Father VanNevel built the first small church on Beacon Avenue. Until that time mass had been celebrated in the home of the Segalerba family. Later, when this first church was destroyed by fire it was replaced by the original St. Elizabeth's on 3rd St under the direction of Reverend Father Scheelen in 1911. 1911 through 1979 the list of pastors of the original St. Elizabeth's included Fathers Cyr, Lewson, Williamson, LeClerc, Phillip and Bernard Hanley; William Mudge, Kevin Wiseman and finally Ray Cunningham. Then in 1979 Bishop Remi DeRoo approved a plan by Fr. Cunningham and the parish committees to take down the original St. Elizabeths and replace it with a new church. During the following construction period, Sidney Pentecostal Church and St. Paul's United Church provided the congregation of St. Elizabeths with a "home" In the Christmas season 1980, upon the 70th anniversary of the original St. Elizabeths, services were inaugurated in a splendid new facility. Father Ray Cunningham continued to serve as pastor at St. Elizabeths until replaced by Father Eugene Trainor as Interim Parish Administrator during which time the two churches were amalgamated into one parish. Fr. Terry MacNamarah served as pastor and is credited with authoring our current parish mission statement. Fr. Jack Sproule from 1986 - 2004, followed by the current pastor Fr. Rolf Hasenack, OP. The facility underwent further expansion in 1996.